If you are planning to pursue academic study abroad this summer, we invite you to consider the Harvard Summer Program in Greece. The program, now in its fifteenth year, is one of the oldest and most successful Harvard study-abroad programs. The five-week course (27 June – 31 July 2016) is divided between the seaside town of Nafplion, and the historical city of Thessaloniki. Greece is an ideal place for summer study: traces of ancient history and culture are found everywhere, and the country has been an important meeting point between East and West across the centuries. The beautiful climate and landscape are additional sources of inspiration. Eight interrelated week-long seminars offer a stimulating approach to cultural exchange, with an emphasis on the legacies of Hellenism, and on imperial encounters in the Mediterranean. The program’s richness is due to its interdisciplinary nature and the diversity of its faculty and students. The seminars combine linguistic, literary, and historical methodologies, while several faculty members (classicists, historians, literary and theater critics) attend each class, making it a real laboratory for collaborative thinking. Our discussions continue over dinner under the olive trees. In the past twelve years students have come from as far afield as the US, England, France, Bulgaria, Greece, Guatemala, Turkey, China, and the Philippines. Weekend excursions take us to some of the country’s most important ancient, medieval, and contemporary sites, such as Athens, Olympia, Epidaurus, Mycenae and Vergina. A rich program of guest lectures, and dramatic performances at the ancient theater of Epidaurus, complete the curriculum. Weekly trips to the beautiful and relatively untouched beaches of the Peloponnese and Northern Greece enable us to enjoy the natural landscape and appreciate its fragility. Whether you are a student of the classics or modern literature, a historian or a scientist, this program will offer you unique insight into the history and representations of cultural interaction between East and West from antiquity to the present day. The course carries 8 credits that in the past have included – but are not restricted to – classics, literature, and history. The course also counts towards Harvard General Education credit. In the past, participants have been recent high school graduates, undergraduates, graduate students, or independent scholars. Please note: Students must be at least 18 years old and in good academic standing to apply. Applications are due January 28, 2016. Students will be notified of admission decisions by mid February. The Seventh Conference of Italian Archaeology will be held at the National University of Ireland, Galway in April 2016, as a successor to the previous meetings held in Lancaster (1977), Sheffield (1980), Cambridge (1984), London (1990), Oxford (1992), and Groningen (2003). The conference will focus on the archaeology of Italy and its islands from prehistory through to the modern period. We hope to provide a forum for debate, as well as the presentation of fresh theoretical and methodological approaches to Italian archaeology. The primary theme of the conference will be the archaeology of death, but we have also panels that consider recent developments in Italian archaeology. In addition a poster session will provide the opportunity for excavators to present site reports and other topics of interest. For further information please contact either Eóin O’Donoghue or Edward Herring. The program supports intensive study of advanced Turkish language at Bogazici University in Istanbul, Turkey. The awards include air fare, tuition, and maintenance stipend. The application deadline is February 5, 2016. The main a im of fieldwork is that of approaching the talaiotic culture to students through different tasks related to an archaeological excavation. Fieldwork will be combined with lab work, lectures, workshops as well as excursions to discover the natural environment of an island which was declared Reserve of the Biosphere by the UNESCO in 1993. During the course free days will be available to students so they can explore and enjoy the traditional horse festivals, whose origins date back to the medieval period, which take place in several towns in Menorca during summertime. 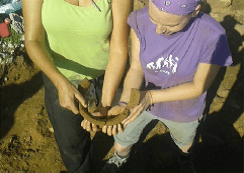 For 2016 Sa Cudia Cremada Field School offers archaeological courses for students interested in gaining first- hand experience on fieldwork and laboratory tasks. We welcome university students, professionals as well as everybody who is interested in Archaeology and Mediterranean Protohistory (Iron Age). Thus, previous experience on the subject in not required. 2016 courses will take place in several sessions with a length of 3 weeks each. During the course, students will dig in the settlement’s sanctuary during the first half of the day, whereas the second part will be devoted to lectures, laboratory tasks and workshops. 3-week course: 1,200 Euro, including: fees, materials, pick-up service upon arrival to Menorca’s airport, accommodation, daily transportation to the site/ the accommodation, accident insurance, snack during school time (sandwich, juice, fruits), lectures with specialists on Biological Antrhopology, Zooarchaeology, Restoration, etc., workshops on Archaeological documentation and Photogrammetry, and weekly excursions (entrance to museums and archaeological sites including on the price). -Transportation to/from Menorca and meals outside school time are not included. The American Research Center in Egypt (ARCE) is pleased to announce its annual fellowship program for predoctoral, postdoctoral and senior scholars conducting research in Egypt. We hope you will take a moment to share this poster with relevant students and faculty members at your university or college. 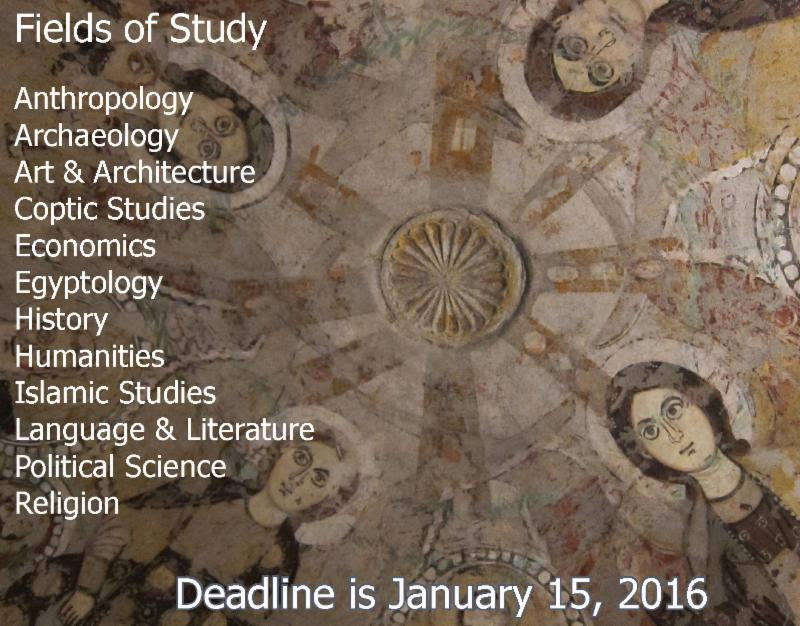 The deadline for application submissions is January 15, 2016. 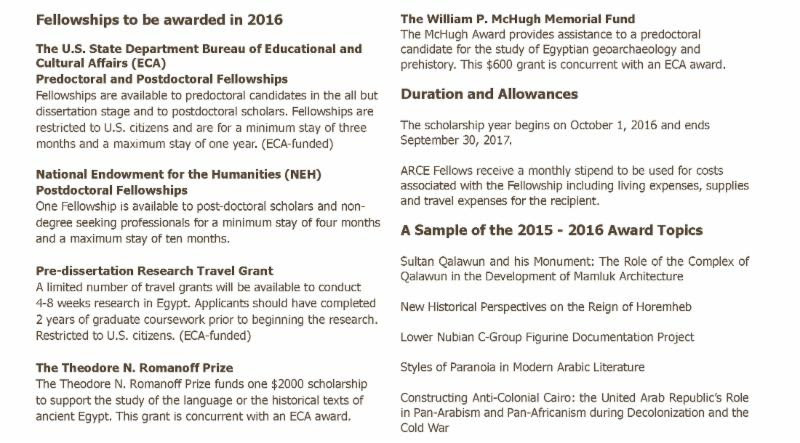 For information about the CAORC Multicountry and Mellon Grants click the link below. ARCE is pleased to announce its participation in the Council of American Overseas Research Centers (CAORC) Multi-Country Research Fellowship Program and Mediterranean Regional Research Fellowship Program. Applicants may propose a research project to one or multiple Mediterranean region countries, as long as at least one of the countries hosts a participating American overseas research center. Funding for this program is generously provided by the Andrew W. Mellon Foundation and administered by the Council of American Overseas Research Centers (CAORC).